In doing so, Reinertsen provides the beginnings of a scientific basis to many of the empirical practices of Agile. Reinertsen says: "I believe that people in the Agile software space are doing a better job at using Lean in Product Development than companies that have forty years of experience with Lean Manufacturing, and that's because the Lean Manufacturing people have this toxic idea that variability is always bad and that it is feasible to eliminate variability. In highly repetitive manufacturing processes there's some truth to that, and in manufacturing processes you don't need to innovate. In Product Development you need to innovate in order to add value. As a result, if you try to drive out variability you drive out all of the innovation!" have to change when the context shifts to Product Development. In terms of applying Lean continuous flow to Software product Development Reinertsen is inclined towards Kanban-based systems over Theory of Constraints-based systems. He recommends David J Anderson's book, Kanban: Successful Evolutionary Change for your Technology Business for elucidation. Reinertsen's book is quite dense: a 600 page book compressed into just under 300 pages. The density makes Don's summary talks worthwhile: he intends to write a 150 page version for non-Engineers "one day". Feedback: fast feedback loops enable better economic performancein the presence of uncertainty. "Provide product developers with good decision support information to make economic decisions." What you get: "An apolitical framework from which to make multivariate trade-offs". Enables effective decentralization of control. The alternative: "Get into ideological debates." Implementation requires the construction of a quantitative model: in questioning Reinertsen said he can build this from the implicit P&L in a typical project business case, and that it's a lot less flaky than the ROI model, but he didn't give an example or recipe. 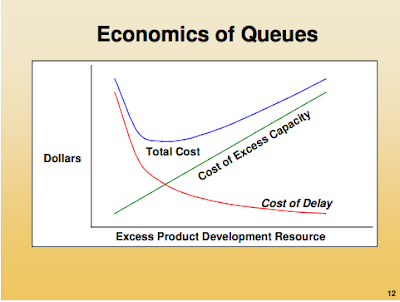 "Invisible, unmanaged queues are the root cause of poor economic performance in Product Development." Managing the invisible: make physical artifacts: e.g. Kanban boards, Scrum boards. Incidentally, these U-shaped optimisations crop up a lot in Lean Product Development. There's upside, too. C.f. Financial modelling: volatility implies opportunity (positive risk), as well as downside (negative risk). This is different from manufacturing, where variability is all bad. 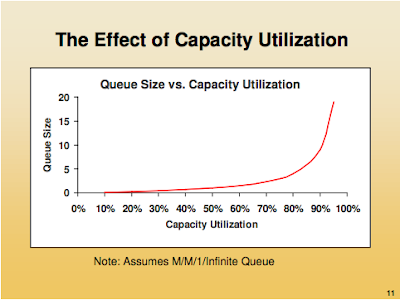 "Halving batch sizes halves queues and halves cycle time." "Reduce cycle time by limiting WIP"
Visual control systems (e.g. Kanban boards) help. These, with cumulative flow diagrams, show queues in a way that Gantt charts don't. "A synchronised cadence offers additional performance advantages." Replace asynchronous processes with synchronous processes. "Proper sequencing offers additional gains." C.f. Hospital emergency room: expedite the person having a heart attack! "Fast feedback loops enable better economic performance in the presence of uncertainty." "Optimum failure rate in product development is frequently 50% (500k ppm); in 6 sigma manufacturing 0.00034% (3.4 ppm)." Stabilise the patient, then treat at leisure: this lowers the Cost of Delay. C.f. Give the customer the most valuable feature(s) first, then take your time with refinements.